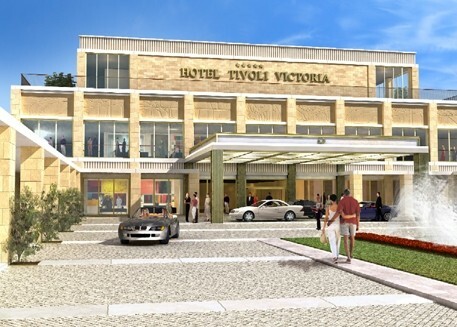 The 5 Star Tivoli Hotel Victoria & Spa is the newest hotel to be added in the Vilamoura area of the Algarve, Portugal. It enjoys a prime position overlooking the sweep of the championship golf course also named Victoria. This luxurious hotel has 280 rooms and suites, and a special Spa for treatments and general relaxation. Each of it rooms and suites are furnished to a high standard and are equipped with all the latest extras that a hotel of this calibre presents to meet the needs of its guests. Each individually air-conditioned bedroom has a safe, mini-bar, Internet connection, WiFi and Voice Mail, satellite and Pay Video channels. Although, nearly all rooms are equipped with twin beds there are 79 bedrooms with a double bed. For the convenience of the guests there is the 'Gourmet' restaurant for dinner under the direction of chef Luis Baena offering a 'fine-dining' cuisine. The 'Buffet' restaurant offers a wonderful selection of hot and cold choices using fresh local produce and quality cuisine. Light snacks can be acquired throughout the day from the Bar which supports the pool area. There are three bars in which guests can relax and enjoy their sun downers. Practise some putting on the hotel green prior to playing a round. Laze around the pool or use the courtesy bus and spend time enjoying the beach club and its many sporting facilities. There are four outdoor pools (one heated adult pool), one of which is reserved for children, and a Health Club, a floodlit tennis courts, a Children's Play Room, and also a Business Centre. The Banyan Tree Spa originates from Laguna, Bhuket. It is a philosophy based on providing a place for rejuvenation of the body, mind and soul - a Sanctuary for the Senses. It provides a trained team of dedicated therapists in an environment which provides peace of mind and internal harmony.